Spring is in the air, and so are spring marathons. Check out our ten top tapering tips to make sure you reach the start line fresh as a sweet Sunday morning. The majority of runners start their taper about three weeks out from their marathon. This is enough time to get in some decent recovery, but not so long that you'll lose fitness before you hit the start line. Your final long run is best done about four weeks out from race day, and no closer than three weeks out. A final shorter race before you start tapering can be a good idea. As well as being a great confidence booster it can serve as a chance to practise your routine for the big day. Have you heard of taper madness? You've got used to a high diet of mileage and now you're doing what feels like nothing. How will you cope? Relax. Your hard-gained fitness won't disappear overnight. Tapering is an important part of preparation so try to remember that it's essential in order to perform at your peak. 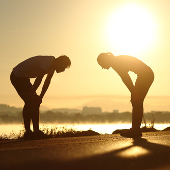 As race day approaches it's unlikely you'll do too little. The real danger is from overdoing it. Err on the side of caution and remember that it's better to go into a race slightly undertrained than slightly overtrained. Doing absolutely nothing for three weeks will definitely leave you rested, but it won't leave you prepared. You're going to be running a marathon, so get in lots of shorter runs at race pace. And a couple of shorter, faster intervals can also help keep you fresh (assuming you've been doing some up until now: see the next tip). However, when tapering the repetition distance should be shorter than usual and recovery should be longer. Avoid undue stress. Never done core work before? Well it can wait. Think your first ever track session will help get you ready? It won't. Now is not the time to start introducing new stimuli. There's not enough time for it to have a training effect. All it can do is harm you. A lot of people decide that a taper is a perfect time to get a nice relaxing sports massage. While this can be beneficial, beware if you've never had one before since they can take their toll. One of the most-annoying things about cutting back running is that the appetite seems to lag behind by a couple of weeks. The obvious danger here is that you end up eating too much and pile on the pounds. This won't completely ruin your race, and it's even possible that the benefit you gain from being well-nourished will outweigh any negative impact of carrying a couple of extra pounds. Whatever you do, don't try to lose weight. Dieting at this point could counteract some of the benefits of tapering and leave you with a lack of energy come race day. There is a danger with tapering that you might end up in “holiday mode” with junk food, alcohol and late nights making an appearance. A good way combat this is to be regimented in your approach. Even though you're tapering you'll still be running, so focus on preparing for and recovering from each individual run, even if that run is only a few miles. Preparing means getting a good night's sleep, eating well and avoiding too much alcohol. Recovery requires the same approach. Take every opportunity to practise your race day routine (apart from actually running 26.2, of course). Plan what time you need to get up on race day, what you'll eat for breakfast and when you'll have it, how you'll warm up, what you'll wear and anything else you can think of. Then practise it all as much as possible. If you're planning on using energy gels or similar in your race then practise taking them on during training runs. Your stomach won't thank you for any surprises come race day. Training not quite gone to plan? It rarely does. Maybe you've been injured or ill? It's fairly common. A big mistake is to try and “make up for lost time” by cramming extra training into the last few weeks. All this will do is make you more tired and likely to under-perform. A sensible approach is to adjust goals if necessary. There will be other opportunities and you'll finish your marathon knowing you did all you could on the day and eager to sign up for the next one.